U.F. Grant invented the Crystal Silk Cylinder in 1954. It was a unique idea for the time, transforming three orange silks into three solid oranges. Jim's first variation was to take the idea of transforming silks to the same balls that are used in Grants 1962 invention  Strat-O-Spheres, but using the exact same tubes for both tricks, and further add an ending of Grants 1953 Bengal Net to turn the three balls back into silks. Jim's other variations for making and performing the Silks to Pit Balls will be found in this article called simply Glass Vase and Tube. You can begin this routine with the Glass Vase and Tube above, change three colored silks into three plastic Pit Balls, and then go right on with the old Strat-O-Sphere routine where one ball passes through the others. Finally, the red ball is taken out of the tube and vanished. It reappears back between the other two balls. So what's new? Click the INFO button for more INFO! To complete the above routine and change the three Pit Balls back to three silks (that you transformed when you did the Glass Vase and Tube), try this variation of Grant's 1953 Bengal Net with some changes that make it easier to handle. Includes a BONUS Grand Finale: Fill up a Pit Ball Tent with hundreds of Pit Balls! Jim Gerrish is not too happy parting with the secret of this rope and silk penetration of his body. He is still using it in his shows, as are a number of other Wiz Kids who have grown into Wiz Men and are still doing magic on a regular basis. Therefore, he will spill the beans, but with no pictures and no DVDs, so it will only be of value to those who can read and follow written instructions. He hopes no one will buy it. The Magician becomes clumsy Inspector Clousseau on the trail of the missing Pink Panther Diamond in this comedy act with a magical ending. Break out all your favorite Peter Sellers/ Steve Martin sight gags and pratfalls, study up on your fake French accent, and get ready to have some fun with this effect. Trevor Lewis has a great trick with a flashlight (Trevor's Torch) that he wrote about in his book Trevor Lewis Uncut. Professor Spellbinder shows you how to make one from Dollar Store stuff for $2.00 ... maybe a little more if you have to shop on the Internet to locate the pieces. Based on an idea by the late Eugene Poinc, Jim Gerrish revives it from the dead as a bizarre winter tale of the living dead...Frosty. An easy to make illusion you will wish you had left in the grave! At first glance, this seems like an ages old trick, but when you read the effect, the experienced Magician or Wizard will know at once there's a difference. It's all done with ordinary, examinable Dollar Store props, yet the ring vanishes and reappears inside a ball of yarn inside the nested boxes. How it gets there is what's new. It appears, it vanishes, it talks, it sings, it dances! And best of all, the whole trick can be made for less than $20! Your next favorite trick may be hiding in the magic flowerpot and all you have to do is drop in the magic seeds and let it grow into a full-fledged comic (and magical) routine! A wooden box that you make yourself is used to make a deck of cards appear, or produce a box of candies, jewelry, dollar bills... for whatever magical purposes you wish to use them. Why is it called the "Elevator Box?" Ah! That's the secret, isn't it? This is dedicated to Allen Hanuska, who requested that I write down my memories of the routine for The Wizards Journal. Allen was looking for an Instant Magician trick, the one where you put your arms through the arms of a magic suit a child is wearing and make it appear that your hands are his hands. I told Allen that my Instant Wizard routine did not involve coming in physical contact with the child, which is becoming a no-no in todays world. So here it is at his request. Jim Gerrish's plans for a year-round outdoor dove aviary that is VERY easy to clean, and just as easy to build because he managed to get Home Depot to do all the hard work for him and used standard sizes that didn't need any cutting, or else he got free cuts at the Depot! The Wizards' Journal #11 - in Print! 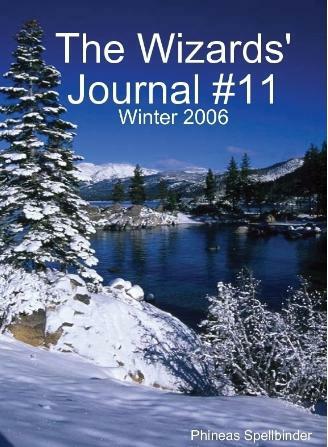 This issue of The Wizards' Journal #11 is now available as a fully printed paperback from Lulu.com: 131 pages, 8.5" x 11", perfect binding, full-color interior ink - $50.00 plus shipping.